SAN DIEGO, CA – June 29, 2017 – The GI Film Festival San Diego is back for its third consecutive year. Taking place Wednesday, Oct. 18 through Sunday, Oct. 22, 2017, the GI Film Festival San Diego brings the stories of America’s military to life through film. It is one of the few film festivals in the entire United States to exclusively feature stories for, by, and about military service members and veterans. With seven major bases between the Navy, Marines, and the Coast Guard, the San Diego region is an ideal location to host a film festival highlighting the incredible stories and talent of service members and veterans. Films selected for this year’s GI Film Festival San Diego feature diverse stories with themes ranging from women in the military, resiliency and recovery, transitioning, and the LGBTQ+ community. Selections also highlight military experiences from within the Hispanic, African American, and Asian cultures. The GI Film Festival San Diego features some of the best films of the GI Film Festival, held each May in Washington D.C. Wars covered in the films span from World War II to the present day conflicts. All major film genres will be presented including dramas, documentaries, and personal narratives in both short and feature length formats. The festival also features the popular Local Film Showcase, which highlights San Diego’s long and important military history. “It’s great to see more and more local filmmakers being featured in the GI Film Festival San Diego,” said Jodi Cilley, founder of the Film Consortium San Diego and organizer of the Local Film Showcase. “I’m excited to feature their work and present some of San Diego’s most exceptional heroes on the big screen for a local audience.” Official selections for the Local Film Showcase will be announced in the coming weeks. An awards ceremony honoring the festival’s best from the Local Film Showcase will be held on Saturday, Oct. 21. Additional festival highlights include the opening night screening and reception at the Museum of Photographic Arts in Balboa Park on Wednesday, Oct. 18. This year, GI Film Festival San Diego will conduct screenings in North County San Diego for the first time, in Carlsbad on Thursday, Oct. 19. The popular Family Movie Night will return to the USS Midway Museum on Friday, Oct. 20. Additional screenings, filmmaker appearances, panel discussions, and related events will be held on Saturday, Oct. 21 and Sunday, Oct. 22. All festival events will be open to the public with special discounted opportunities for active duty personnel and veterans. Ticket sales begin Aug. 1, 2017. Additional information is available at GIFilmFestivalSD.org. 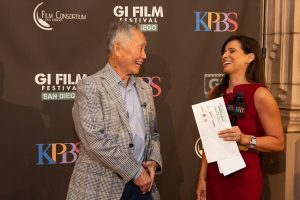 The 2017 GI Film Festival San Diego is organized by KPBS in partnership with the GI Film Group and Film Consortium San Diego. Official sponsors of the 2017 GI Film Festival San Diego include Kaminskiy Design and Remodeling, City National Bank, Bob Baker Subaru, GEICO Military, and Scatena Daniels Communications. Alaska Airlines is the official travel sponsor. The GI Film Group is a full-service media company dedicated to preserving the stories of military veterans. GIFG is the production entity behind the award-winning GI Film Festival (GIFF), a 501c(3), also known as “Sundance for the Troops,” which is held each May in Washington, DC. The festival is the first in the nation to exclusively celebrate the successes and sacrifices of the service member through the medium of film. “Bud’s Odyssey” – On a mission over the Mediterranean, B-17 Pilot Robert “Bud” Kingsbury and his crew are shot down. Kingsbury becomes the sole survivor by swimming 32 hours to the Italian shore, and then spends 20 months in Stalag Luft III. After years of suffering with sole survivor’s guilt and severe PTSD, he finds a road to healing and reconciliation. “Call Me Ma’am” – Based on a true story, “Call Me Ma’am” is a visual expression of what it was like to be a new Navy officer from a woman’s point of view. When she first shows up, she’s lost and not welcomed by her subordinates or superiors. Through hard work and dedication, she gains the respect of her crew, but must still go head to head with the tyrant that runs the department. “Charlie & Sam” – In 2016, fewer than five percent of American World War II veterans remain alive. Follow 97-year-old World War II Naval Aviator Charlie Edwards as he travels to meet his old squadronmate Sam Takis for the first time since the end of the war. “Comedy Boot Camp: The Documentary” – WHRO Public Media’s original production follows a class of veteran comedians as they learn to use humor as a way to share their journeys and connect their stories to others. Through the Comedy Bootcamp program, the participants attended weekly classes led by professional stand-up comedians designed to help the individuals of the military community develop their performing and writing skills. With a concluding White House performance, the participants share their stories of resilience, hope, and humor. “The Last Ring Home” – This is the incredible story of Navy officer and World War II hero, Lieutenant Minter Dial, and his last wish to have his Annapolis ring returned to his wife after two and a half years of horrific imprisonment by the Japanese in the Philippines. With 25 years of research and 130 interviews with his grandparents’ peers, Minter’s grandson embarked on a journey to discover his grandparents and bring healing to his father. “The Last Ring Home” uncovers the mystery of how the ring was lost and found and, importantly, the lasting legacy it had on all those it touched. “Places Like This” – A group of veterans embark on a six-day winter expedition into the Colorado wilderness. Through the Outward Bound program for veterans, 11 strangers come from all over the country seeking peace, answers, and direction by using the wilderness as a vessel to carry them both spiritually and physically to reach a peak of more than 13,000 feet. Each veteran will take the same path to a different destination in this visually stunning and emotionally charged film. “Resurface” – After years of nightmares, depression, and seizures, Bobby Lane, an Iraq War veteran, could see no way out of his trauma other than suicide. Then he met Van Curaza, a former big wave surfer who founded Operation Surf, and dedicated his life to helping veterans find solace in surfing. “The Rifleman’s Violin” – With wit and verve, 90-year-old virtuoso violinist Stuart Canin recounts how, as a 19-year-old GI, he deployed to the German front with his rifle and violin on his back during World War II. After Germany capitulated, Canin was once again pressed into service, this time as a musician in the Army’s 6817th Soldiers Show Company. After a few weeks entertaining wounded troops, Canin was dispatched to Potsdam on the outskirts of Berlin to perform privately for the Big Three – Harry Truman, Winston Churchill and Josef Stalin – in an effort to break the ice during the negotiations over the division of Europe and the prosecution of the war against Japan. “We Can Do It: Stories of Rosie the Riveter” – In World War II, millions of courageous women, most of them teenagers, joined the labor force and coined the term “Rosie the Riveter.” They didn’t realize they were changing the world forever.